A follow-up to our feature on Hull's Black sailors, focusing on their involvement in the Second World War. On 3 September 1939, Prime Minister Neville Chamberlain declared that Britain was once again in a state of war with Germany. As the country prepared for the second global conflict within three decades, men and women looked to help the war effort by joining the British Army, Navy or Royal Airforce or alternatively contributing to industries and services on the Home Front. However, in the early years of the war, an unofficial colour bar was in operation in some branches of the forces and thus excluded people of African descent from helping the war effort. For example, Lilian Bailey was told to leave her job in a NAAFI canteen, serving food and drink to servicemen, after seven weeks because her father had not been born in the United Kingdom. Furthermore, Marika Sherwood has found evidence which demonstrates that Black men were excluded from the Royal Navy. There does appear to have been exceptions such as Frank Bailey, who served until he was discharged due to severe asthma, highlighting a gulf between policy and implementation. However, Frank was light skinned and his African heritage may have been overlooked for many reasons. While a colour bar was exercised in the Royal Navy, men of African descent from Britain and the colonies were welcomed into the Merchant Marine from the outset. Although, many joined the war effort by signing up to vessels in the West Indies and in Africa, most of the seamen of African descent were British born or had been working in Britain for several years. It is believed by historians such as Ray Costello, that at the outbreak of the Second World War, seaman from around the British Empire accounted for around one third of the shipping industry's labour force. Many had been born in the Caribbean, Africa and Asia. As highlighted in our previous release on sailors of African descent, the interwar years had proven to be a turbulent era. However, the Second World War once again created a thirst for workers in the maritime sphere and Black seamen were happy to fill the gap in the labour market which somewhat eased social and economic tensions. As Costello has demonstrated in Liverpool, newspapers celebrated the bravery and heroism of Black seamen. However, this trend has not yet been identified in local Hull newspapers. 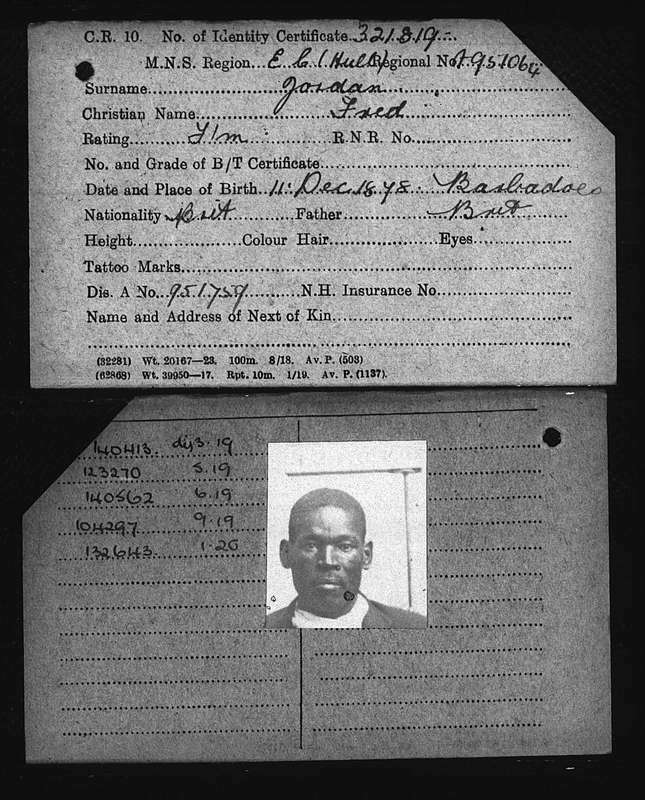 While the pivotal role of the Merchant Marine was acknowledged in the city, preliminary searches do not suggest that individual acts of bravery by Black sailors were highlighted in correspondence about the war. In fact, during the conflict articles found on sailors of African descent tended to be about crime. However, they are in line with other reports on contemporary criminal activity and court appearances. Read our first feature on Black sailors in Hull. Although, there were a large proportion of Black sailors operating in the maritime sphere between 1939 and 1945, no crews which consisted completely of men of African descent have been identified as leaving the port of Hull. On board cargo and fishing ships, crews were made up of a myriad of people from all over the world. Many seamen of African descent who sailed from this region had lived in Hull for several years and had very good connections. Thus, it is believed they were treated fairly and equally on board ships departing from this area. Although there was no colour bar exercised in the Merchant Navy, the racial hierarchy identified in the early twenty first century, was still in operation after the outbreak of the Second World War. Thus, most seaman of African descent who served in the Second World War, much like the First, were firemen, trimmers, cooks and stewards. Hull, much like Liverpool, Cardiff and South Shields, had their own resident Black sailors who served as part of the Merchant Navy during the Second World War. A large proportion of these men had relocated to Britain to serve in the First World War and had eventually settled in Hull. 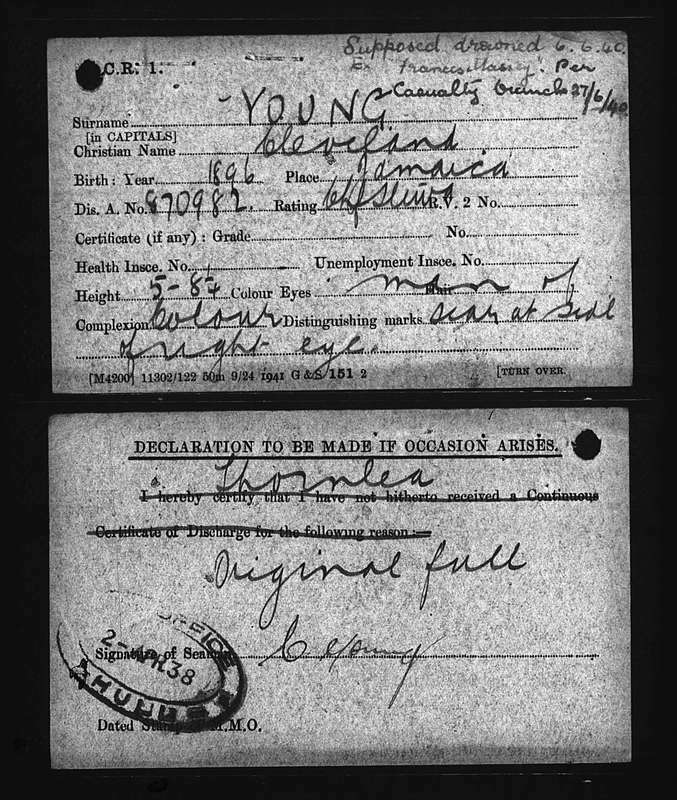 Cleveland Young was among the seaman of African descent who had settled in this region in the first half of the twentieth century. 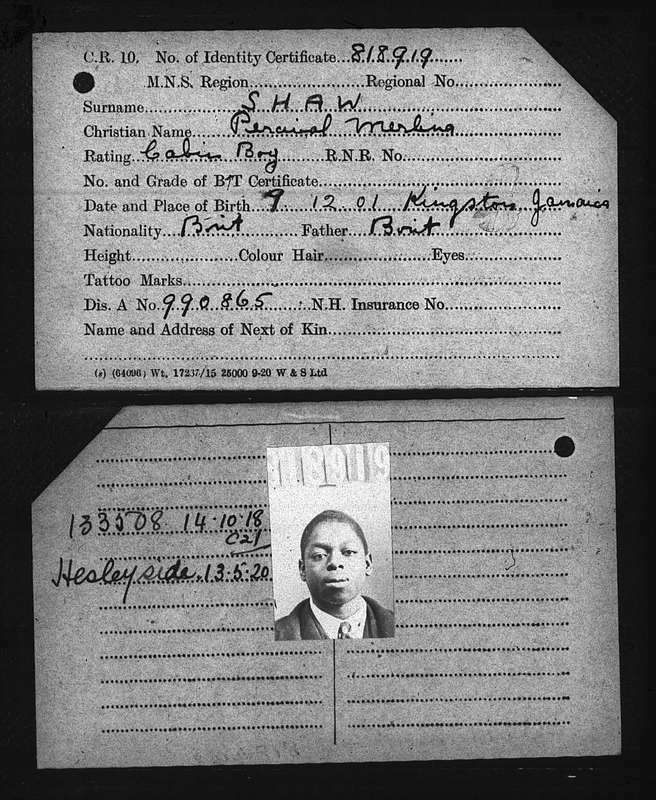 He was born in Jamaica around 1896 and was part of the Merchant Marine during the First World War. After the conflict, he remained in Hull and married a local woman named Elizabeth in 1920. He continued working in the maritime sphere during the interwar years and resumed his service during the Second World War. In 1940, Young boarded the Hull owned vessel Frances Massey employed as a steward. Sadly he never returned from this voyage as the vessel was hit by a torpedo off Tory Island. The ship reportedly sank within 30 seconds killing 33 out of the 34 crewmen. The sole survivor was Walter Whitehead, the master. Young's last known address was 109 Wincolmlee Street, Hull. Percival Merlin Shaw’s CR.10 card. Another Black sailor, Percival Merlin Shaw, also lived in Hull for many years before the outbreak of the Second World War. In the early 1920s, the Jamaican had settled in this region and by 1924 had married Amy Montgomery. He worked on board local ships for many years. However, in the summer of 1940, Shaw boarded the Winga as a cook and sadly never returned. The vessel sank after a collision on 2 June 1944. His last known address was 17 King Street, Hull. Many other sailors of African descent who perished at sea as a result of enemy attack were recorded as living in Hull before their deaths. For example, it was noted that able seaman James F. Clements, who was born around 1890 in the Cayman Islands lived at 54 Tatman Street, Hull in the early 1940s. Sadly, Clements died in 1943 after his ship was captured and he was taken prisoner of war by the Japanese. He is buried in the Yokohama War Cemetery in Japan. His gravestone, which is a cross, reads ‘J. F. Clements, Able Seaman, S. S. Gemstone, 21 February 1943, Age 59. In addition, Perez Darrell, who was born in the West Indies in 1885 was recorded as living in St Andrews Terrace, Gillett Street Hull before his death in 1941. Darrell was killed on board the Holmside, while employed as an able seaman, after the vessel was torpedoed and sank in the Atlantic Ocean. Read an extended feature on Guyana-born Hull sailor Henry St. Clair Allsopp. With many thanks to Jim Baker for supplying some of the research featured in this piece. Marika Sherwood, Blacks in the Royal Navy, Black and Asian Newsletter, 23 (1999), p. 13-15. Ray Costello, Black Salt: Seafarers of African Descent on British Ships (Liverpool: Liverpool University Press, 2012), p. 171. Commonwealth War Graves Commission, https://www.cwgc.org/search-results?term=Fred%20Jordan&name=Fred%20Jordan&fullname=Fred%20Jordan and https://www.cwgc.org/find-war-dead/casualty/2782133/davis,-george/, accessed 16/05/2018. Commonwealth War Graves Commission, https://www.cwgc.org/find-war-dead/casualty/2782133/davis,-george/, accessed 16/05/2018. Commonwealth War Graves Commission, https://www.cwgc.org/find-war-dead/casualty/2207776/clements,-james-f./, accessed 15/05/2018.